Someone recently told me they didn't know you could turn off extensions you don't use in sqldev so I thought a quick blog may be in order. 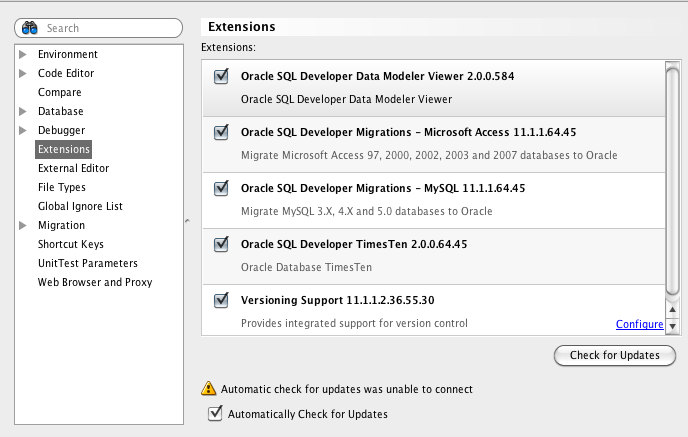 Since SQL Developer and jDeveloper are based on the concept of extensions, they can do things like check for updates or install new extensions very easily. The other side of that is that you can disable the extensions you don't use. A couple example of things we include by default but you may not use are the modeler, migrations, and times ten support. All you have to do is goto Tools->Preferences in the main menu and then uncheck the ones you don't want. The result is some menus don't get installed, some code is now not running at startup and you have a slimmer IDE since you turned off the parts you don't use anyway.